In April 2006 and on the occasion of their 20th record the Berlin based label Mo’s Ferry Prod. released a special compilation. In answer to progressive digitalisation of club music and the rash swan songs on the vinyl record, like „Vinyl is the way of the dinosaurs“, the label owners turned the tables. 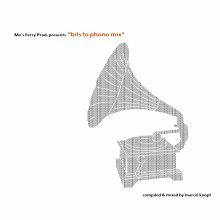 Marcel Knopf – by then A&R and label DJ for many years and who presents his debut „Dusty Dance“ right at the moment – compiled his favourite net label tracks, which got pressed for the first time on a vinyl record properly named „Bits to Phono“. Among were artists like Franco Cinelli, Lump, Ryan Crosson and Dapayk, who had been doing some releases for free on labels such as Textone, Unfoundsound, Archipel and many more. Furthermore Marcel Knopf mixed a CD with these and other tracks, that were released on Mo’s Ferry in the next years.